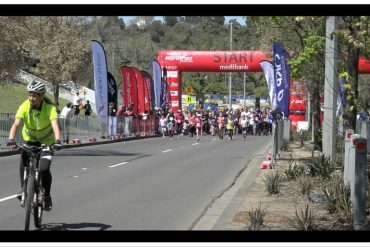 Sport has become more than just a game to supporters around Australia, Tahlia Sinclair reports. Standing on the edge of two platforms loading planes was a daily activity for baggage handler Stewart Wood. But taking a step back from the edge, he believed he was stepping onto another platform. Unknown to him, the platform had been removed and he fell backwards, landing on steel rollers two metres below. Wood’s injuries left him home bound, with limited movement in his left arm and not much to do with his time. Already an avid NRL fan he became further involved in his NRL club, and found himself to be a devoted fan – even booking his surgery around the team’s fixture. “I didn’t want to miss any of their home games. Going to games on the weekend gave me something to look forward to and get out of the house,” he says. 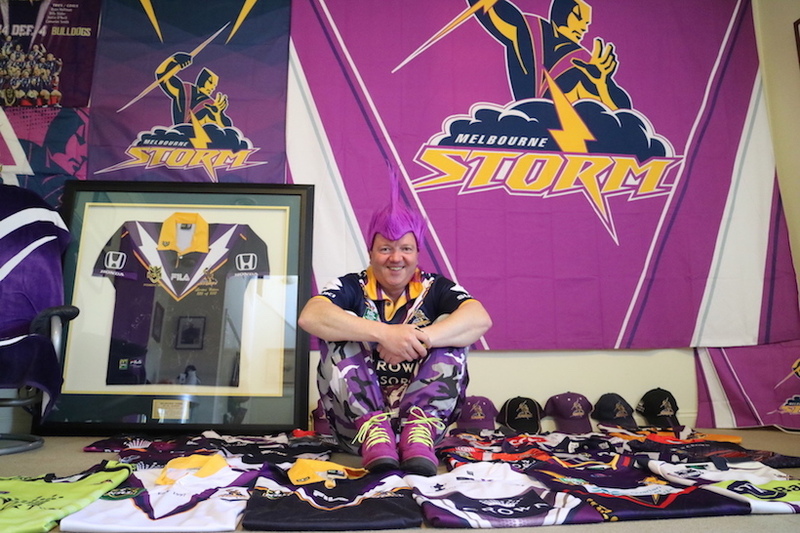 Excited to show off his team spirit and in anticipation of being photographed, Wood decked the walls and floor of his lounge room in a barricade of purple. His purple mohawk, army pants, and velour boots blending seamlessly with his homemade set. The 44-year-old had grown up an Essendon VFL supporter, but when the competition expanded to become the AFL he thought it lost its magic. In 1998 a new sport opened up to the Tullamarine local when the Melbourne Storm was founded. Wood jumped onto the Storm bandwagon early, and has been escaping to games ever since. Research published by the University of Western Sydney School of Business in 2014 showed that, like Wood, NRL fans attend games to escape stress in their everyday lives. The study also found that many individuals felt loyal towards their club and became more extroverted at games. “If you’d told me five years ago I’d be here like this I’d have laughed at you. It’s just a bit of fun though. It makes people smile, so it makes me smile. It feels good,” he says. American Psychology Association research shows people follow sport to boost self esteem and satisfy a need to belong. These feelings are not specific to one sport. While completing a Sydney TAFE course in 2014 Joey Nicita, 24, began to follow the Big Bash League to impress a group of friends. “They were talking about it [BBL] one day, and I thought I should give it a try. I just wanted to fit in, and have a common interest with them,” says Nicita, who is wearing his Nice Gary shirt, a nod to Australian cricketer Nathan ‘Gary’ Lyon. Nicita recalls bonding with an old man at a game. The two started talking before the game and though Nicita has not seen the man since it’s one of his fondest cricket memories. All three agree on the feeling after a game. Win or lose, emotions run high for these supporters. After years of disappointment over her team’s performance in the AFL Gauci says she is used to not winning. “It’s not the greatest feeling. When you win though you do feel better about yourself, it’s hard to explain. 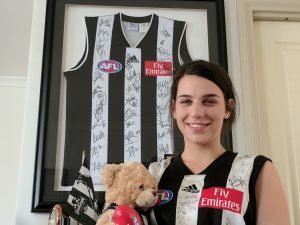 Then you get home and realise it’s a bit silly, and is all just a game.” Collingwood’s 2010 premiership memorabilia surrounds her as a reminder of the success her club once had. Wood, whose team won the NRL premiership this year, says he isn’t used to losing. He goes into games expecting to win, and laughs that the Melbourne boys know how to beat the Sydney boys at their own game. “When you lose, it’s gut wrenching. You don’t know what to do with yourself, but when you win. Oh boy,” he says. For these supporters the sport they follow is more than just a game. Each feels an emotional connection to their team. Gauci says she had no choice but to support Collingwood and follow in the family tradition. She wouldn’t change it for the world. Nicita wanted to connect with new friends, and he did. Wood says he found a new family within the Storm community. As he finishes speaking he pulls his mohawk off; under the bright purple facade is the everyday brown hair of an airport worker.